Family games are something I am trying to encourage more of now the girls are older, reviewing Randomise seemed a good way of doing that, especially for Eva. You can buy Randomise on Amazon for £11.99. I found some great family games taking part in the #SDFiverChallenge and want to stock up on some more fab games too. Randomise is a family game suitable from 8 to 80 years and for 4 to 40 players. 4 of more players are needed, players are then split into two teams with someone picked to keep score. Each team is given a scoring and timing card and any blank cards that haven’t been written on are removed from the pack before shuffling. The person keeping score gets to start with teams alternating every each turn. The idea of the game is to declare if you will be picking an easy or hard challenge and whether you are going to describe, act of draw your identity. You then pick a card from each pile (A, B & C) and try to describe, act or draw your way to victory. ‘A’ cards are description cards such as hairy, sweaty & angry. ‘B’ cards tell you what you are such as a caveman, jellyfish or astronaut. ‘C’ cards tell you what you are doing such as Baking a cake, surfing or smashing plates! If you have chosen to describe your identity you have 30 seconds to communicate without using the words on your cards, rhyming words or letters to give clues. 60 seconds are given if you choose to act out your identity without making any noises, pointing or using props. For drawing your identity you have 90 seconds to communicate the phrase without drawing any letters or numbers. Your team can make as many guesses as they like whilst you communicate your identity with the aim to discover your identity before your time is up. All Levels – 1 point for every successful guess from your team. Easy – 1 point if your team shouts your full identity before your turn is up. Hard – 3 points when your team correctly shouts your full identity. To Win – The first team to reach 30 points claims victory! There are also alternative gameplays in the rules for you to try out too! We love Randomise! It really gets you thinking about how to act/describe/draw your full identity so your team members can guess correctly. Eva really enjoyed Randomise and said she would love more family games like this. I think this will be a fun family game to pull out over the Christmas period to keep everyone entertained. There are so many combinations and we love the fact we can add to blank cards. We love the silliness of the identities too, it is so much fun to play! 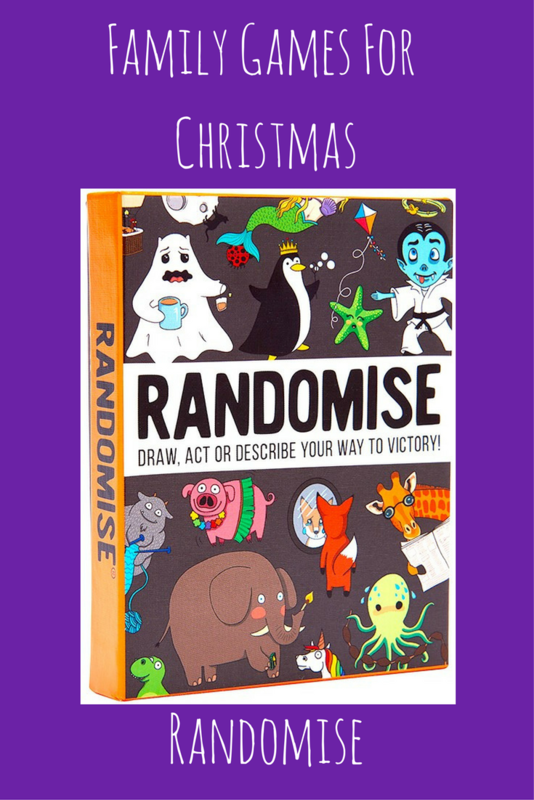 Family games are a great way of entertaining everyone, do you like the sound of Randomise? What is your favourite family game? Ahh! We have been playing this too. We love it. I think it's going to be a game we get out over and over again! x Kim Carberry recently posted...Randomise game: Draw, act or describe your way to victory!